95 members have or want this plant for trade. Love this flower.. This is the first time I planted the seed. It has grown up to 3 feet. It finally bloomed, just two blooms thou, after closing they fell off. It produce several buds but some are dropping off. Can anybody tell the cause as to why? I just received a plant that a friend of mine who had started them by seed this spring of 2011.. I have never had one of these so this will be a new experience for me and I am pretty excited. Of course I will grow it as an annual and save some seeds for next year. I heard they do not like wet soil and since I have clay some of my areas seem to take forever to dry so I think I found the perfect area in full sun. My big concern is where I plant it since I have 3 large dogs that are twig, grass, dried leaf eaters. I ended up fencing it off to keep them away from the plant. As you know I received this plant from a friend... read more who grows them in the same area starting them from seed. 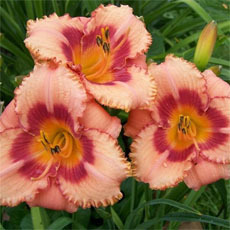 Hers are grown in pots and do very well with a nice size plant and many flowers. She over winters them in a cold storage where it does not freeze and the seem to make it thru. Mine didn't do as well, it was planted directly into the ground in full sun but the soil was a high clay base and with all the rain it took the plant a long time to take off. It reached about 2ft tall with a single stem and only a couple flowers. The plant did produce 2 seed pods but they were removed to prevent any seed droppings from growing this 2012 spring. The plant will not over winter in my area so once it died I removed it. I decided due to the severe toxicity of the plant even when dead and dried and recently getting 2 small breed puppies I will not be planting this plant again in my garden. It is a very pretty plant..for those in more southern zones that is. I didn't get my first bloom until we were having our first frosts. This plant may be poisonous to ingest, but it sure is a feast for the eyes and the nose! I caught a fragrant whiff in our garden this evening and was pleasantly surprised to find that one of the Purple People Eaters flowers is in full bloom -- it was just a huge bud two days ago! I purchased this plant from Michigan Bulb -- actually had to ask for a replacement of the first one they sent because that remained three inches tall for months, with just the leaves getting larger and larger. Things worked out the second time, though. I am now enjoying the second flush of flowers from our three-month old plant. I repotted it to a 12-inch terra cotta pot and was rewarded with six flo... read morewers of different sizes/stages...in addition to the one in full bloom, two more are getting ready to do the same. There are three much smaller flower buds that should be at their spectacular peak in a week or so. In summer of 2005 I purchased a pot of 'Black Currant Swirl' Datura metel in a 10" pot.It produced blooms and seed pods. I planted seeds and made several other plants. I placed pot in full sun with success. I left one pot outside of greenhouse. My winter temperature dropped to 20 degs. The Dature sprouted again this Spring of 2006. It is an easy plant to grow; whose beauty is majestic. Please give this one a try; you will be pleased. The white and dark purple are an interesting contrast. I have a relatively young plant and it has already produced seeds. I stuck one in the ground out of curiosity and was supprised to find it growing the next day. An interesting way of remembering the difference between Trumpets: Devil's Trumpet look up at heaven, while Angel's Trumpet look down. Absolutely NO CARE ! 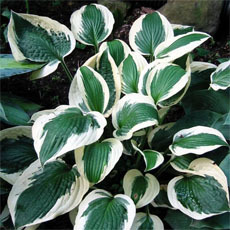 I grow them along with the Brugsmansia and have had good success in full sun and in part shade. While an annual, a few of mine in protected areas "regenerated" in the spring. The more sun exposure, the shorter the plant and larger the flowers, less sun exposure, greater height but still plenty of flowers. The purple stems and deep green foliage is quite striking against the lighter color foliage of the Brugs. Planted in front of the larger Brugs, Datura covers / hides the leggy lower stems of the Brug. 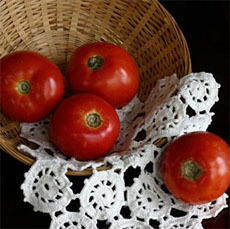 I've grown MANY of these from seeds; they are easily propagated from seeds, although some patience is required, as some seedlings take much longer than others to emerge -up to 21 days. These are easily started in pots and transplanted to the garden - I usually plant 3 - 4 in one 5" pot and then transplant them to their own pots when they get their first real leaf. They will grow fast if you keep transplanting them up to larger pots and don't let them get root-bound. I usually put them in the garden when they are 1' or more high. These require pretty much full sun to bloom and do well. 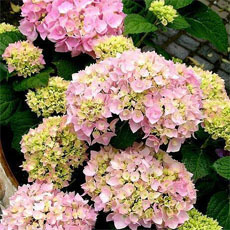 I have found if they are planted in the shade with will have few blooms. Partial sun is ok, but they will be more 'leggy'. They will bloom in pots if you keep them in the sun and keep moving them up to ... read morelarger pots as needed. 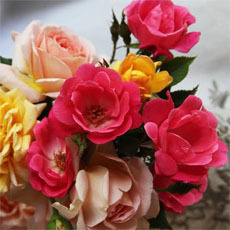 Very fragrant flower, as well as beautiful and easy to care for. I love this plant. I always knew it as a Datura, never knew it was called so many other names. I have bought it as a plant and have grown it from seed. I have mine planted next to my Moon Flowers and they compliment each other, blooming at night.... I live in Austin, TX and it grows and blooms beautifully. This plant grew on its own where a chicken coop used to be. 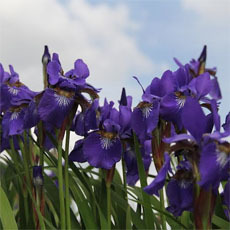 It has a beautiful triple-purple flower and large dark green leaves with a sturdy dark purple stem. It's 6.5 feet tall and growing. We usally get 1-3 blooms per night. The fragrance is overwhelming. There are several seed pods. We have had rain everyday for the last 2 months, and our temperatures have been around 90°F. We love this plant. This plant is outstanding for the stark difference in colors. I recently obtained my first purple and loved the first flush of blooms. I have other peach/lite yellow bloomer with a wonderful scent, and I want to learn everything about brugs; at this point, I only have bits and pieces. I'm trying to get some landscaping going here at my new house, and I saw a few pics of the 'Black Currant Swirl' Datura on Webshots. I've been in love with Datura for a very long time. I've always had good luck growing the plant myself, but I've never tried it anywhere but on the west coast - California, Washington & Nevada (U.S.) I saw a lot of Tree Datura in New Orleans, but lived in an apartment there, so I never got to experiment with growing any myself. Datura metel is a showpiece in the Florida garden. The picture I uploaded demonstrates the plant's ability to produce up to three distinct blossoms within blossoms. 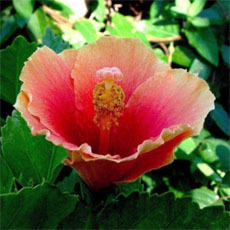 Although some daturas are without fragrance, this particular plant produces flowers with a delicate, slightly spicy aroma. A most welcome garden sentry. Datura metel has grown in my perennial bed for several years, reseeding itself with plenty of plants to give away. This is in central Florida, east of Tampa. Last year a cold spell killed them and no new seedlings have sprouted. The lovely flowers have won blue ribbons at the flower show in the past. Excellent fast growing. Accepts all soil types, ie: clay alkaline. Blooms year round here in Phoenix, AZ. Loves water. 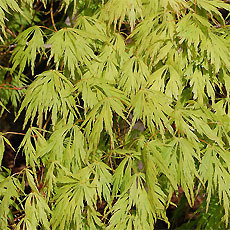 Will not tolerate direct sunlight, causes leaves to shrink and or drop. Beautiful flowers. You'll never be without enough seeds. Favorite food of giant horn worm caterpillar. I grew 'Black Currant Swirl' a couple of years ago, and it was just beautiful. I didn't have the proper place for it during the winter, so I had to give it to one my friends. I tried growing it from one of the seeds again, and it grew but it never bloomed. I am not sure why that happened. This summer I had pale purple ones growing in my flower bed, they were over 5 ft tall, but not really that many blooms on them. I guess the weather would play a big part, as the nights got quite cool and we did not have really hot days. 'Black Currant Swirl' is dark purple with creamy color center. It is very fragrant that permeates the air at night. 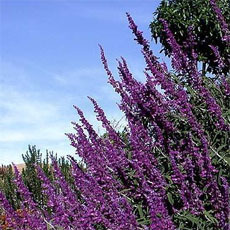 The plant stands to 3 feet and the main stem is dark purple in color, too.